Sometimes the simplest dishes are the hardest to get right. This method for the classic fish and chips will give you perfect results every time. This method requires some extra preparation time to soak the chips before cooking, and to drain the batter; but it's worth it. 1. Peel the potatoes and cut into thick chips. Soak in cold water for 30 minutes. * Drain and transfer to a pot with two litres of fresh cold water and add the white vinegar. Bring to a low simmer, then reduce the heat and simmer for 20 minutes. Drain the chips and arrange on a baking tray. Dry the chips in a low oven (about 60C, fan-forced) for 30 minutes. 2. For the beer batter, combine 1 1/2 cups of flour with the beer and stir to combine to a thick batter. Don't mix the batter too much. A few lumps is fine. Rest in the fridge for at least 20 minutes. 3. Heat the oil to 200C and fry the chips in batches for three minutes each, allowing the oil to return to temperature between batches. Drain the chips on a wire rack or absorbent paper, uncovered for 20 minutes. You can freeze the chips at this point for frying later. 4. When ready to serve, fry the chips again at 200C for a further three minutes until golden brown. Toss the chips with plenty of salt and keep warm in the oven while you cook the fish. * Soaking removes excess starch and stops the potato straws from sticking together and becoming gluggy when they are cooked. 5. Reduce the heat of the oil to 180C. Dust the flathead fillets lightly with the reserved flour and dip into the batter. Shake off any excess batter and fry the fish for about four minutes until the batter is golden. Drain on a wire rack and season with salt. 6. 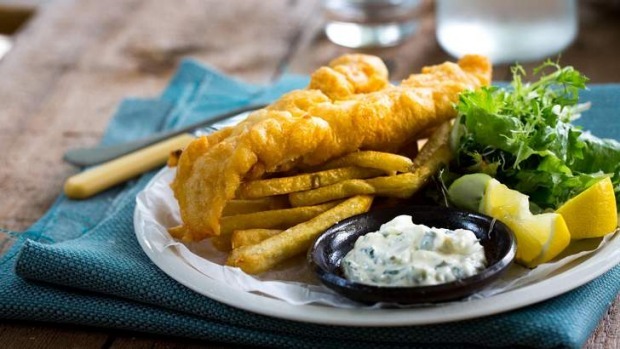 Serve the fish and chips with wedges of lemon, tartare sauce and an undressed crisp green salad.